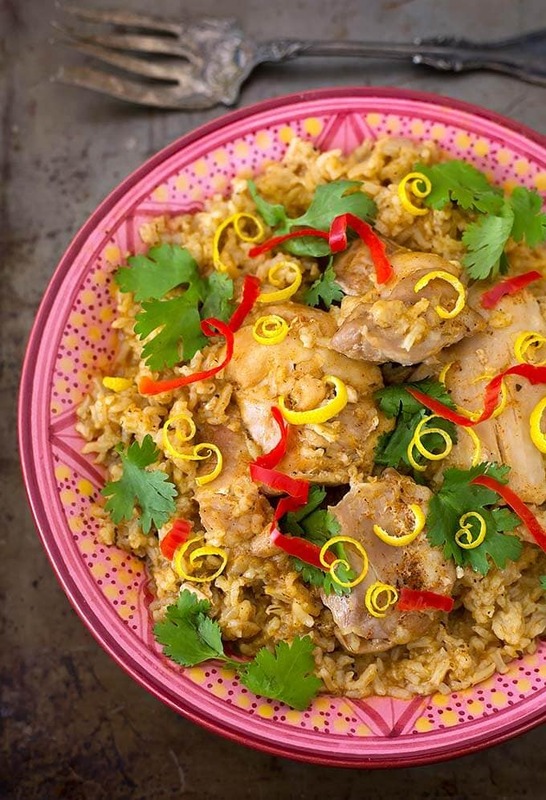 Instant Pot Mini – Jerk Thighs and Rice is very flavorful, thanks to a good Jamaican jerk seasoning, and a few extra ingredients. The chicken thighs can go in frozen, and come out tender and infused with flavor! 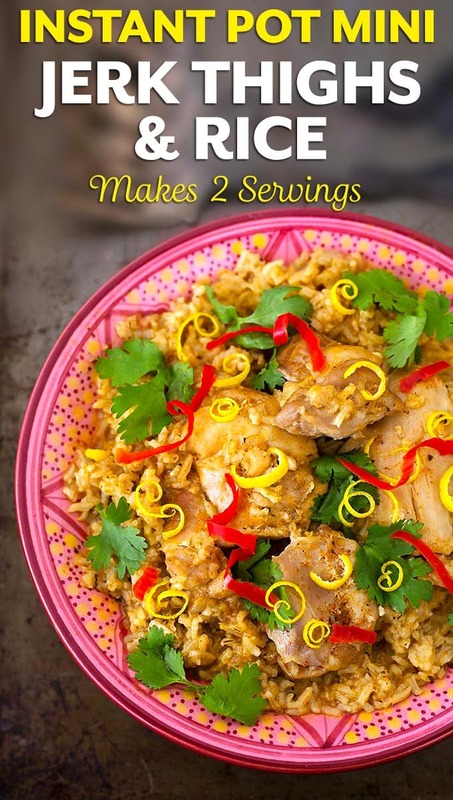 This pressure cooker chicken and rice recipe makes a nice meal for two. Last year we went to the Caribbean. It was so warm and colorful, with the bluest water I have ever seen (and I’m from Washington!)! I had never been anywhere like that before, so I wanted to try all kinds of things, like snorkeling, visiting the botanical gardens, and meeting the wonderful local people. Of course that also included sampling the local cuisine! One of the places we visited was Roatán, one of Honduras’s Caribbean Bay Islands. We got the local royal treatment! What a great place to visit! After visiting so many parts of the island, and learning about their culture, we had lunch at a little known “restaurant” next to a zip line that ran through the rain forest. My Brother in Law had an iguana and rice dish. I took one look at the bones and just couldn’t. I thought I was adventurous, but he totally showed me up! I did have fried plantains, red beans and rice, and a wonderful spicy lobster tail. It was spicy and sweet and delicious! That lobster tail is what inspired this dish. But I wanted it to be really simple, and made in the Instant Pot! The closest I could come to the flavor was a Jamaican jerk seasoning. Those blends are readily available in the grocery store, and I haven’t had a bad one! 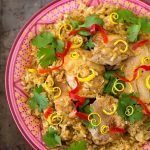 The biggest difference I have found is that some are saltier than others, so I don’t include salt as an ingredient in this Instant Pot Mini – Jerk Thighs and Rice dish. Just season with salt at the table if you need to. Instant Pot Mini Jerk Thighs and Rice is very flavorful. thanks to Jamaican jerk seasoning, and a few extra ingredients. This recipe makes a nice easy meal for two. Rinse the rice until the water runs clear. Drain and set aside. Turn the pot on to the Sauté function (Normal/Med heat). When the display reads "Hot" add the oil. Add the onion and stir. Cook a few minutes, stirring occasionally, until it starts to turn translucent. Add the garlic and stir. Cook, stirring constantly, about 20 seconds. Add the jerk seasoning, stir well. Stir in the chicken broth. Let it come to a simmer, then stir in the rice. Make sure all of it is submerged. Lay the thighs in the broth mixture. Submerge them if possible. They will shrink a bit as they cook and will sink in a little on their own. Put the lid on the pot and lock it in place. Set the steam release knob to the Sealing position. Press Pressure Cook (Manual) and then the + or - to choose 7 minutes. When the cooking cycle ends, let the pot sit for 5 minutes. Then turn the steam release knob to the Venting position to release the remaining pressure/steam. When the pin in the lid drops, open the lid and remove the chicken thighs (you can either serve one thigh each, or break up the meat and mix it back in with the rice). Give the rice a stir and dish it up. Don't use salt until you taste the dish. Most Jerk Seasoning has salt in it. **You can use Cajun or Taco, for a different flavor profile! Sandy, i don’t have any white long grain rice but i have a 6 grains blend. can i use that instead? will the flavour be affected as a result? Hi Yvonne, I would try it and see what happens. I haven’t used this rice blend in this recipe before. Hi, I have the lux mini… could I cook 4 thighs instead of 2? Should i increase the cook time by a few minutes? Thanks! Hi Lisa, I think you can add 2 more thighs without changing the cook time. As long as they fit! You don’t want the rice to over cook, so I wouldn’t add any time. I made this recipe this evening (with a few minor adjustments due to location), and it is wonderful! I used brown basmati rice, three bone-in chicken thighs, and increased my stock by about 1/2 cup to ensure appropriate coverage of the rice and chicken. I also made my own jerk seasoning (Pinterest is awesome) because it’s not available here in Saudi Arabia (I’m American, DH is working here). I chose to debone the chicken and shred it, then add it back to the rice. The dish reminds me of the traditional chicken and rice, but without the creaminess from cream of mushroom soup. But the flavor is soooo much better. Super easy, super versatile (definitely trying a Mexican version of this next week) and super quick! Thanks for the recipe! Hi Stacey, what a great way to make this your own! It sounds tasty, and the brown rice is so good! Thank you for your review! I have the mini but I was wondering can I use only legs? And if so how many do you think? Also, would I be able to add more than 3/4 cup of rice? We are a rice family. Thanks! Hi Mai, yes you can use only legs, as many as you can fit. It may be a balancing act between the increased amount of rice, and chicken legs. I just got an IP Mini on Amazon prime day and this will be my first attempt at using a pressure cooker! Just want to double check that it’s okay to use frozen boneless thighs without affecting the cooking time or having the rice come out mushy. Hi JB, yes, if they are boneless. Try it this way and see how you like them. You can always make adjustments for the future. The tricky thing is the rice, and rinsing very well first helps a lot. Also, different rices give different results. I use long grain white rice. If you don’t get perfect results your first time, don’t give up! You can make little adjustments that suit your situation. Please let me know how it works for you. This came out so good! I read some jerk recipes online and based on them also added a tablespoon of soy sauce, a tablespoon of brown sugar, the juice of a lime, and 1/4 teaspoon of cayenne, although next time I would add 1/2 tsp. My jerk seasoning wasn’t very spicy or salty, so it all worked out great. My chicken thighs were small so I put in all 4 from the package. They fit under the liquid. I shredded them when they were done and mixed in with the rice. The rice was perfectly cooked. It was delicious! That’s great, Janet! I’m glad you enjoyed this recipe! I like how you jazzed up the jerk seasoning you already had. My favorite brand of jerk seasoning is from Spiceologist. It’s called Rasta Rub. It’s really delicious! Made this with Jasmine rice! Googled Jamaican jerk seaoning & made my own! Came out great! Little heat to it but good! Also shredded up the thighs into large pieces and mixed it into the rice mixture! I only have long grain brown rice, what adjustments would I have to make to use it. Hi Michele, the brown rice has a much longer cook time (20 to 22 minutes) than the chicken thighs, so they can’t be cooked together. I would cook the brown rice separately, then combine them. Add some jerk seasoning to the rice water, and reduce the water in the IP to 1 cup. Then coat the thighs in the jerk rub and cook for 8 to 10 minutes, with a 5 to 10 minute natural release. That’s my best guess!